Using facts straight from today’s headlines, Brian Kenneth Swain, author of World Hunger, takes a fictional but frightening “what-if” look at the genetically modified foods currently being grown and consumed around the world. Looking through the eyes of the three major players: the corporate giants that control the purse strings, the scientists who are trying to play by the rules of ethics, and the environmentalists who vehemently oppose this exploitation of nature, Swain tells a gripping story of exploitation versus assistance. Whether big business should be allowed to “own” plant species created by nature such as corn and rice that have been planted by farmers for centuries. World Hunger is a fast-paced thought-provoking exploration of the biotech industry and its impacts on the foods we eat every day. Thought some of you might be interested in this news article concerning GM foods in Europe. I was wondering do you believe we, as a nation, are on a dangerous path for the future when it comes to food? If so, what do you think is the driving factor that is causing us to be on this dangerous path? I’m not sure I would characterize tour entire trajectory as “dangerous,” though there are certainly some developments that I’m not comfortable with. On the one hand, we have an enormous and growing array of choices when it comes to the food we eat, though this, of course, places the burden squarely on the consumer to seek out the healthiest choices. On the downside, we continue to offer an enormous range of unhealthy fare, including, in some cases, vast quantities of fat, sugar, salt, chemicals, and assorted undesirable ingredients. As a consequence, we live in a country where bad food continues to be significantly less expensive than good food, a fact that leads directly to the sub-part diets and frequent obesity of low-income Americans. So it’s kind of a mixed story, with plenty of choice and plenty of opportunity to get it wrong! During our Skype conversation on Wednesday, you said that the United States takes their risks on foreign land rather than on their homeland. Do you feel this is a flaw of the United states? I also would like to know if you think we are the most wasteful country in the world even with our attempts at creating programs to recycle and reuse. I do believe the U.S. (and the West in general) suffers from the legacies of our imperialistic days in the sense that we have a strong tendency to offshore much of our risks to other places. It’s a sort-of “out of sight, out of mind” mentality that allows American companies to hide some of the true costs of doing business, be they in the form of unknown risks or well-understood but unpleasant side effects of industrial processes. As it happens, many Third World countries have lax or nonexistent environmental regulations that allow us to dispose of waste or employ processes that would not be allowed in this country. A great example is the vast amount of electronic waste (old computers, cell phones, TVs, etc.) that get sent to companies in China for final disposal. These companies, in turn, pay employees a pittance to remove all of the toxic substances (at significant personal health risk) that go into the original manufacture of the items. It’s a systemic problem that’s been around fro many year and which shows no signs of abating. If anything, as the U.S. continues to strengthen its environmental regulations, such offshoring is likely to increase. It seemed that industrialized agriculture was looked down upon in your book. For my essay, I was on the side of changing agriculture completely by advocating why urban agriculture should be considered. What is your take on this topic? The only reading I’ve done recently on urban agriculture is concerning so-called “vertical framing.” This involves building skyscrapers with all glass windows in which crops can be grown in subsequent floors instead of across vast tracts of open land. I think that conceptually this makes a lot of sense, particularly from the perspective of minimizing distances that food has to be shipped to get it today from farm fields to the inner cities where the consumers live. What is less clear to me are the economics of the scheme. There are numerous technical difficulties to be overcome, like, for example, how do you economically pump water up long vertical distances (the greater the height, the more power required), how do you supply adequate sunlight to the plants on floors that have other floors above them (which would be every floor except the top!). In addition, there is the simple problem of whether vertical farming is the most efficient use of such space in an expensive urban setting (as opposed to using it for office buildings, living spaces, etc. It’s a fascinating but very complex undertaking about which much has been written in recent years. I look forward to hearing what conclusions you come to from your research and writing. I loved your book and thank you so much for the Skype conversation yesterday. I have one more question for you though. Was it your intent for Chase to come off as unethical and heartless or simply only concerned with money? In some parts he seams to only focus on the business aspect of Project Evergreen, willing to do anything to please his investors, but on page 137 he says, “If anybody’s guilty of something here, it’s me for pushing too hard on a project that just wasn’t ready yet.” It seems as if he is showing remorse for pushing the project too hard. My question is just that considering his prior behavior, why does he now apologize? First I wanted to thank you for the Skype chat yesterday. That was very helpful. However, I did not get the chance to ask a question. I was wondering, if humans reacted in the same way that the insects reacted to consuming the plants, would a human grow into a superhuman? Of course it isn’t possible to answer that question, since the whole concept is fictional anyway. That said, there has been much concern in the post-GM era about transgenic crops fed, for example, to cows and other herbivores. Ironically, though, people who seem quite intent on seeking out non-GM vegetables and grains tend to be less diligent about finding, as well, meat products whose feed might have been GM too. I’m not aware of any adverse effects of GM crops as animal feed, but it is most definitely a concern for a lot of people. I didn’t clarify enough, and i apologize for that. I was referring to the World Hunger universe specifically. Considering as you are the creator and overseer of that world have you thought something like that could happen as a plot twist, etc? Or would that cross the lines of realism you have placed on that universe? I deliberately chose not to go in the direction of GM effects on the mammals in the story (including humans), partly because I felt it would detract from the main thrust of the narrative (the insects), but also for one specific scientific reason. Insects reproduce much faster than mammals, and the genetic effects of the sort that transpired in the novel would take many generations to manifest themselves. Therefore, what you see happening to the insects in a matter of weeks and months would take years or decades to happen to mammals. Thus, even if useful from a narrative perspective, having these sorts of effects happen to people wouldn’t have been technically plausible. In the first couple of chapters, the readers are already introduced to an egghead of a CEO of a company that has so much potential of changing the world. This does end up happening, but not in a good way, but does the presence of a supercilious leader over a company that exploits other countries for testing their products a symbol for a real life issue? I suppose what i mean to say is, is the book trying to make a stab at the U.S.’s somewhat unquestioned presence as a super power bully in getting what it wants from other countries? There are plenty of unpopulated places in the U.S. of varied climates, but Robert Chase and Co. still own land in other foreign countries for the dirty work to take place. I was just wondering if this was intended at all. This is probably normal in today’s economy, it is just ironic that other 3rd world countries (i think) are taking the hits for what the U.S. ultimately screwed up. There were a few reasons for choosing a range of non-U.S. locations for the GM crop testing. First, I felt that it simply made for a better, more interesting story, vs. having everything take place in NJ, Texas, or California (though that likely could have worked too). As I mentioned in one of my class interviews, I think also that the reaction of the various cultures to the growing challenges of Evergreen made, as well, for a better story. And, yes, to your point, I think there is an element of post-colonialism to the choice as well, i.e., the idea that we tend to like to export as much of our risk as possible to far-flung places. In the case of WH, it’s the risk of something going wrong with GM testing. But in other real-world examples, we do the same every day with toxic waste, unwanted old computers and other electronics, ship dismantling, and a host of other unpleasant problems that are easily foisted onto others. I really appreciate all of the effort you’re giving to our class. Towards the end of the book, the ants are revealed to be colonizing and the two-foot spiders began spreading inland. This suggests that, while the company may have seemed to solve the issue at hand while attempting to take a step towards solving world hunger, there was still a deeply rooted problem that remained to be solved. Is this reflective of current agricultural companies or projects? In other words, what’s the chance that supposedly beneficial things like the abundant corn industry will only end up placing us in a dependent or worse situation than we were initially in? I appreciate, as well, the opportunity I’ve had to interact with the class, both online and, now, face-to-face. There are most definitely residual problems for the Evergreen team, and, more likely, humanity in general, as the insects continue to spread and affect crops and animals/people in the various locations. As you suggest, the abundance of something — be it a food item, or a fuel like oil — most definitely creates a situation of crisis when that item suddenly becomes unavailable. This may be because the item is completely unobtainable, or simply that its cost rises suddenly, as is the current situation with many foods. As we increasingly utilize a portion of the corn crop to make ethanol for fuel, this has the effect of driving up corn (for food) prices, to the detriment of us all, since virtually all food these days is affected in some way by corn. I couldn’t help but notice as I read your novel that much of the dialogue between the scientists occurs over meals, nachos, and the like. Was this intentional? Do you believe that food plays a unique role in bringing people together? This was the sort of intimacy I was wondering about in my previous question, as well. Do you believe that GM and processed foods affect this natural and organic sort of intimacy that we experience as we come together over food? I’m not sure that the presence of meals and food-related conversations throughout the novel reflects anything other than my overall sense that these tend to be a major reason why groups of people get together, whether for social or professional reasons. It wasn’t my intent (not intentionally anyway) to use this device as some sort of metaphor for the GM-related challenges faced by the book’s main characters. It’s an interesting connection though, and perhaps a missed opportunity, i.e. that there wasn’t more explicit connection between the GM issues and the food being consumed by the characters throughout the story. I read the description of your writing career on the back of World Hunger, and the impression I got was that you primarily write poetry. If this is the case, what inspired you to make the jump from writing poetry to a novel? Did you decide to write a novel and then choose the subject matter of World Hunger, or was the subject matter included in World Hunger what caused you to write a novel in the first place? As you surmise, I have spent quite a lot of time writing poetry and I enjoy it immensely. Tough to say what specific catalyst caused me to start writing fiction, but it began in earnest with the drafting of World Hunger, which I started in mid-2005. I have also done quite a few short stories and am about to publish a second novel, so the fiction continues, at least for the moment. I think the order of inspiration, if you like, for WH was that I had the concept for a story about GM in my head for a good while prior to actually sitting down to write. It was always going to be fiction though, the only issues being length, characters, and story details. I should say, as a side note, that one of the reasons I went in a fiction direction was in the hopes of increasing my readership somewhat. Poetry has reached an unfortunate point in this country whereby pretty much the only people who read poems are those who also write thjem, meaning that we’re basically writing for one another. That’s fine, as far as it goes, but it does not provide nearly the audience possibility that fiction does, in which the majority of readers are not themselves writers, but simply people who enjoy a good story. This month our school, Brophy College Preparatory, we have been celebrating our summit on human dignity. This year the name of our summit is called, “Food: From Farm to Table.” I also noticed your response to Tommy Mroz how GM has its long term negative effects on humans. So my question for you is that with all the junk they put in and on our food, would you classify a majority of these foods as “trash” before we even receive our food on our tables. First, just to clarify my position, I don’t believe it’s at all clear yet what, if any, long-term health effects might accrue from consuming GM food, negative or positive. Indeed, there are several varieties (e.g., golden rice) whose immediate health effects are demonstrably positive, in that they provide enhanced levels of certain vitamins previously missing from the diets of people in the countries where such rice is grown. As for whether our food, in general, is trash, that’s a mighty bold leap I would not be prepared to make. It depends, of course, on what you buy and consume. There are plenty of trashy items out there, most of which fall under the processed food category. on the other hand, there are plenty of healthy options too. I will say, though, that we have to do a good deal of searching to locate the good stuff. And it is also a bit ironic that we live in a country where food that’s bad for you, as a rule, costs less than food that’s good for you. Whenever I take a trip to my local supermarket, hundreds of colorful labels catch my eye in the aisles. They claim to be different than competitors and healthier by not adding Hormone X or using Artificial Flavor Y. Yet the barely comprehensible ingredients in the fine print tell me otherwise. I can’t help but feel a little deceived and offended at what they try to pass off as good for us. As others have pointed out, our Summit on Human Dignity concerns today’s food industry and ties directly into your didactic GM thriller. My question is what is your prediction of the path the food industry will take in the next few generations? Is the age of wholesome, “natural” food products coming to an end? Lots of possible directions we could go with your question, since the notion of the “path of the food industry” is so wide open. I will forego heading in the direction of overall world food supplies and whether we can continue to manage to feed the world’s inexorably growing population, as well as trends in the cost of food worldwide (heading rapidly upward at the moment). I think there will always be a market for (and supply of) natural foods, keeping in mind that the very term “natural” is fraught with uncertainty and ambiguity (Does it mean organic? Pesticide-free? Non-GM? Something else?). You may have noticed, though, in recent years, the fact that natural/organic/wholesome foods have become a good deal more mainstream. Whereas for many years you had to venture to a place like Whole Foods to find such products, they now comprise a significant and growing portion of the product mix at stores like WalMart. So, in that regard, I remain optimistic. Where I am less so is in areas like food labeling, which companies only agree to do basically because the government forces them to. There has recently been a move afoot to force processed-food companies to prominently label foods that contain GMO content, a suggestion the companies have fought tooth and nail, partly because they know this would mean telling their customers about things they don’t want them knowing, and, amazingly enough, partly because they can’t even say for sure which of their products do or do not contain GMOs to begin with. Frito-Lay, for example, is on record as stating that its food supply chain is so complex that it has no way of knowing whether there are or are not GM agricultural products in its potato chips and other snack foods. The fact that many companies aren’t certain what’s in their products is something I find a bit concerning! I’ve heard the opinion expressed many times before that food and eating are personal and intimate experiences. How do you feel that GM and other scientific manipulations of our food affect the level of intimacy that is involved in our food experiences? I will assume here that by “intimate” you mean that these decisions are personal ones and that no one, including for example, government entities, have any business telling us what to eat and what not to eat. At some level, I agree with this, although I do think that government has a role to play in the process, including food labeling, determination of safety, oversight of recall situations, that sort of thing. I think there is probably also an appropriate government role for advising on school food programs, given the sometimes low quality of food that gets fed to kids these days in school. Like many others posted on this thread, yours is a complex question that deserves a lot more detail than can be provided here. Similar to a recent reply by one of my peers, I was also enamored in Robert Chase’s “glorified” demise. I noticed in your response that you strived to create a more “complicated” experience for the readers in deciphering Chase’s character. I was simply wondering about your personal perception of Chase, and whether you purposely exemplified Chase’s love for large spiders (the Brazilian pets he had) as a preamble to his own demise? I think that in many ways Chase is the most complicated character in the story. At face value, he is easy to dislike. Yet he acts in response to pressures that few ever get to experience, and it’s difficult to fathom whether his seemingly unethical actions are a true part of his nature or a by-product of his professional situation. I certainly don’t think he is a victim in any sense (well, until the spider room scene anyway). He is strong-willed and, yet, readily affected by the things that take place around him. And, as I’ve mentioned earlier, my real hope is that the final scene in which he pulls the briefcase from the door (causing it to lock him in with the ants and spiders) causes the reader to take another look at how they regard him. Throughout the book Chase’s character comes off as the business side of agriculture. Did you intend in any way for Chase’s behavior to reflect the way current agriculture companies go about doing business? I don’t think there’s anything about Chase’s motivations or behavior that are particularly unique to this industry. He is, rather, a melding of how I imagine the heads of various corporations could be expected to respond to a crisis situation, whether involving GMOs or any other new technology. I do believe, though, that the economic pressures on GM seed companies are such, given the enormous amounts of time and money required to bring new technologies to market, that they will continue to push as hard as they can for early adoption of their products. How much money would a real life company stand to gain from something like the Evergreen project? And have there been instances in real life where GM companies have pushed their product to the market to soon? I have enjoyed reading your novel and I love its relevance to our modern world progress. I like how you even use the names of recent restaurants, news networks, and vehicles (McDonalds, CNN, Honda Civic). Is it required that you ask these companies for permission to use their names and product names in your writing? No requirements I’m aware of concerning permissions, etc. before using real product and company names in writing. The only real issue in this regard was choosing not to use a real GM seed company name (like, say, Monsanto) as the company in the book. Given how the story played out, that might have been problematic. Hi Mr. Swain, I have another question for you. Robert Chase seems to epitomize all the negative aspects of big corporation, and his death towards the end of the novel comes as no surprise. I was just wondering if there was significance in the fact that Chase’s greed driven demise lead to the discovery of an effective pesticide. I think it is very significant that Chase’s demise leads directly to identifying the new pesticide. It’s a sort-of post-mortem redemption that I hope was alluded to earlier when his last conscious act was to pull the lab door closed so that the insects couldn’t escape the sealed room, even though he knew that doing so ensured his own death. My goal with this sequence of events was to make it a little more complicated figuring out how the reader should feel about Chase. You said in one of your previous answers that Vanguard could apply to any major seed company today. And that you had had the company “Monsanto” in your head throughout the drafting process. I’m curious, have you had any personal experience with any major seed company? Or expressed your viewpoint on GM crops? If so, did you get a response and if you did, what was the response? Sadly, I have never had the opportunity to interact directly with an individual from one of the big GM seed companies, though I would dearly love to do so. Just for laughs, I actually mailed a copy of the book to the CEO of Monsanto, but I never received a response. To be expected, I suppose! I am another one of Mr. Damaso’s students and I was wondering if any of the characters in the book are based on actual people that you know. Which one of the characters do you consider your views most similar to as well? All of the characters are, in many ways, amalgamations of many people I know. Chase, for example, is an assemblage of numerous high-level corporate executives, whereas Julia comes from the large number of academic/scientific people I’ve encountered throughout my life. To some degree, my views align with all three of the main protagonists, though much more with Julia and Barett than Chase. I include Chase in this statement, though, because, as unlikable as his character is, he, nonetheless, makes many valid points throughout the story. I am a student of Mr. Damaso. I really enjoy your book and your skill at writing science fiction is obvious. I was wondering if some of the irrelevant parts of the book pertain to you? For instance, do you enjoy the book The Phantom Tollbooth? While I was reading this good book, are at ch 47, we many times I thought that there could be no hope. Then you insert some in, only to have it turned around again. But I was wondering during the meeting with WHO, what is like real life and what is not? Also why do you choose to have the characters so compliant then but so frustrated and stressed through there problem, and not seeking other help? Thanks and I am enjoying the novel. I have never attended any meetings or met anyone who works for the WHO, so that bit of the story is largely imagined. As for the various sources of assistance that the Evergreen team seeks out (once it’s clear they have a problem), remember that they are torn between multiple opposing forces, i.e., the corporation (in the person of Chase) who wants to keep the whole affair quiet, the governmental organizations who want the problem solved, and the environmental groups (in the person of Hansen) who want to exploit the situation for their own organizational goals. As a result, the logical course of action is at no point entirely obvious, though it may seem this way to outsiders. In fact, there is an enormous body of literature in the business community about how best to handle crisis management, and there are as many different opinions on the subject as there are “experts” writing about it. Actually there are numerous small details inserted into my fiction that come from my own life. And “The Phantom Tollbooth” is a wonderful example. It was a favorite of mine as a child, and continues to be a popular children’s book, even though it was written 50 years ago. I think that adding numerous small details like this adds a great deal of verisimilitude to a story, particularly when they are real-life details that others can relate to as well. The answer is absolutely yes! In fact, if you have ever flown in an airliner, odds are pretty good you’ve been part of such a hands-off landing yourself, as it is a very common occurrence these days, particularly in bad weather or reduced-visibility situations. In fact, modern aircraft can handle the entire flight (take-off, navigation, mid-course corrections, and landing (even on trans-continental flights), without there being anyone even sitting in the cockpit (though that practice is, of course, not recommended). The only part that hasn’t been automated yet is taxiing around on the ground at the airport. According to my prior knowledge on genetically modified organisms, I don’t find it possible for eating them to genetically modify the consumer. Is there any symbolic reasoning for defying science’s information. Couple of things: First, because WH is a work of fiction, that of course gives license to employ any plot devices I care to, just so long as the resulting story is a decent one. Second, I’d be most curious to learn about any definitive research that has concluded that these sorts of cross-species genetic effect transfers are categorically impossible, particularly given that it is demonstrably possible from one plant type to another (see my earlier comments about superweeds). What is really at issue here is whether such transgenic transference could occur from plants to animals or vice versa (either through ingestion or via some other means perhaps). Based on what I’ve read, while unlikely, it would be awfully difficult to rule out such a thing definitively. Let’s hope we never find out! I looked into finding a little but more about you, Mr. Swain (how’s it feel to be famous!? ), and you are known for poetry and writings of deep reflection about “love, war, friendship, family, death” (Secret Places summary). I find each subject nearly paralleled in your novel such as in the war between EarthAlert and Vanguard, friendship between Julia and Barett, the death of innocent civilians, and etcetera etcetera. I’m not looking for why you decided to write on the topic of GMs, but a bit deeper on why you are a professional in this field of causing deep, reflective thought onto the reader, and of the reality of this world. I think one of the greatest challenges for any writer, irrespective of which type of writing is being undertaken, is to tell a compelling story that includes many different but complementary facets of the real human experience. Most writers and critics would tell you that what makes a story great is if the characters are believable and the author succeeds in making you care about what happens to them. On a similar note, most readers want to see a degree of evolution (or growth, if you prefer) in each character (the major ones anyway) from the start of the story to the end. What is their “journey” about, and how have they changed by the end? The essence of story telling is creating great characters and then putting them into situations of conflict to see how they react. Hopefully in this story the reactions of Julia, Chase, and Barett to their shared conflict (Evergreen) are not only different, but consistent with each person’s character as built up throughout the preceding narrative. I don’t quite feel that I answered your question, but hopefully I at least got close! A wonderful response; I get the gist of what you’re getting at there. A bit more on the playful side, but I get the feeling that you intentionally ignored my question on what’s it like to be a published author. If you will, I’m looking for a response about the lifestyle, enjoyment, or perhaps disgusting overload as a writer. Mr. Damaso has let us know that you’re rather excited about the enjoyment of your book. Just to keep all of this in perspective, I am definitely not a full-time writer, nor one who makes his living at it. It’s more of a hobby, to be precise. That said, it’s a part of my life that I enjoy greatly, not only the writing itself, but subsequent interactions like these. I certainly don’t consider myself overloaded with writing-related commitments at this point, though I wouldn’t mind having that problem, as it would presumably mean that I had a wildly successful book on my hands, which is, of course, every writer’s dream, whether or not they care to admit it. There’s a part of me that fears that doing this full-time, with actual contracts, publisher commitments, travel, all that stuff, might actually take away a good deal of the enjoyment. As it is, I can go as quickly or slowly as I like, and I can take on whatever commitments I decide to. But yes, to your final point, I have greatly enjoyed tackling all of your class questions these past few days and I look forward to next week’s calls. I am yet another one of Mr. Damaso’s students with a question for you. My question is why you chose insects to be basically the main “bad guys” or damage doers in your novel. Do you yourself have a person fascination with insects, or maybe even a fear? I am really enjoying your novel and we all appreciate you answering all of our questions. I have varying opinions of insects, depending on which ones we’re talking about. As noted elsewhere, I am no fan of the spider (not, technically speaking, an insect, but in the same ballpark), particularly the big hairy variety. There are no insects that I’m afraid of, though there are plenty of annoying ones (like fire ants, mosquitoes, etc. ), and plenty that fascinate me and which I could watch closely for hours, including ants, as well as dragonflies, grasshoppers, etc. I am particularly fond of ants though, mainly because of their highly social nature and their ability to collectively accomplish phenomenal things. I am also a student of Mr. Damaso. My question is: Does weather play a foreshadowing role in the book? I can’t honestly say that was the idea. If it seems that way, I would chalk it up to coincidence. In his “ten rules for writers,” the author Elmore Leonard said “Never start a book with the weather.” Not quite sure how that applies here, but it seemed an interesting (and at least somewhat germane) bit of trivia! Corporations are often shown bending the system to their favor, but does EarthAlert do so on the same level? Reed Hanson continually lies to Julia as his way to beat the system (instead of waiting for regular press releases). Is Hanson representative of EarthAlert and EarthAlert is meant to be seen with this less than proper behavior, or is Hanson meant to be seen acting alone and only using EarthAlert as a means to forward his own agenda? The Reed Hansen character was not intended as an indictment of nonprofits in general or environmental groups in particular. Hansen is, simply, a highly driven individual who, while his motives are sound enough (environmental preservation), is flawed enough to exploit his personal relationships to advance the agenda of the organization he heads. I believe that’s a pretty common flaw in a lot of people, i.e., allowing a less-than-perfect personal moral system (which is true of everyone) to influence actions that are taken in an organizational setting. Recently in the United States, more and more people continue to evaluate corporate executive greed in our country. With this in mind, did you design Vanguard’s CEO, Robert Chase, with any traits of a specific high profile CEO of an American corporation? Also, do you believe that an unfair and negative stereotype has been assigned to corporations and executives due to problems with a few? I can honestly say that Chase is not based on any specific individual. That said, recall that this novel was being written back around 2005/2006, i.e., only a few years after a highly visible spate of corporate malfeasance that attended the dot.com implosion, including Enron, Worldcom, Global Crossing, Quest, and numerous others. In all these cases, the CEOs and other high-level executives engaged in abuses of various sorts that, in most cases, led to the ultimate collapse of their respective companies. Therefore, there was no lack of bad executive behavior from which to draw in creating the Chase character. To your second point, yes, I agree that the actions of a few have tainted the overall reputations of the many. However, all CEOs regularly end up in situations where they have to make difficult trade-off decisions about safety, transparency, crisis management, etc., meaning that there is ample opportunity for any CEO to get into the sorts of situations that Chase found himself in (and which ultimately was his undoing). Surprise surprise, I am also reading World Hunger for Mr. Damaso’s renowned Honors English II class. As I read more and more into the story, I found tiny hints into each character’s personal life, whether flashbacks before the story (Barett’s ‘switching off his emotions’ after a personal catastrophe, or Julia’s crestfallen betrayal by Reed Hansen). These intrigued me: do these personal afflictions and tribulations carry any significance to the narrative and plotline? I know Julia’s ‘thing’ with Reed obviously contributes to the dramatic aspect of Reed’s backstabbing; but other than that, is it simply backstory or an underlying subtext? A challenge for me is creating believable characters who can carry the narrative forward while also being individuals that the reader cares about in their own right. To that end, I try to not only show the characters’ direct involvement with the story, but also provide lots of details about their lives (past and present) to make them more well-rounded people. In that sense, the story of Barett’s past marital situation falls into the same category as periodic anecdotes about Harry (Julia’s son). I also am a student in Mr. Damaso’s class and I’ve been having a very interesting time reading your book. The book, as well as our recent Summit on Food Production at school, really makes me wonder about the state of our food production today and the likelihood of such mutations of creatures to occur. Have you wanted to write stories ever since you were a child? I’m trying to figure out where I want to go in life and I was wondering at what point your ideas came to you. I was also curious about the possibility of a sequel to this book. I have not finished (about half way) but I feel like more people need to see the possible threats genetically engineered crops. Thanks for your time and I’ve really been enjoying your book. My writing “path” has been a circuitous one and frequently interrupted. I wrote quite a lot of poetry in high school (virtually all of it now mercifully lost), but then I didn’t do any writing at all for many years, only getting back into it in a serious way perhaps ten years ago. I do not attempt to make a living at it, but, rather, do it simply because I love it (which is probably the best reason for doing anything). There is something deeply rewarding about having people read your work and become engaged in it. I have discussed sequel ideas with a few friends, and I have two concepts that I like as possibilities (which I can’t spell out here lest I ruin the ending of the book for you). That said, I have numerous other projects in the pipeline for the foreseeable future, so it will be some time before work gets going on World Hunger, Part 2. Although I have already asked a question earlier last week, I thought of another one that intrigued me. What basis did you use to create each of the characters? For example, do you think you personally relate to one of them and formed their actions and thoughts based upon your characteristics and personality? Also, in the book, you told how the GMO’s did not protect and resist insect attacks by a large margin as they had expected them to. In fact, it had about the same resistance to attacks as the natural crop, but, in addition, it effected a terrible change on the natural attackers. Did you write this in metaphor to resemble our society? Such as, as society continues creating newer technologies and supplements to coat its foods with chemicals thought by consumers as good for themselves, they are actually making the situation worse for themselves as well as more harmful to them through natural repercussions. And I’m sorry for the lengthy question, but this will most definitely help with my essay. Thank you. I probably most closely identify with Barett, not in any scientific way, but simply having worked in a corporate setting for many years and having dealt with unreasonable bosses who take great pains to avoid bad news, and who, when forced to face that bad news, quite often stick their heads in the sand rather than dealing with it in an effective and judicious manner. You give me perhaps a bit too much credit as far as creating a metaphor for human hubris in that portion of the plot in which the initial greenhouse tests fail to realize the expected results. Still, the concept makes a good deal of sense, and I like the parallelism of the idea. If it should happen to come up in a future interview, I’ll be sure to mention it but give you the credit! I find your book extremely interesting, and I enjoy reading it for class. I was intrigued by your use of monster ants, and their ability to destroy everything. I wonder if your use of ants might stem from your own emotions. I considered that your powerful writing of ants might come from your feelings towards them. Do you have a personal fear of ants, or do you just think of them as a good tool of destruction for your novel? I have no fear of ants (as opposed to spiders, which I’m not comfortable at all with). In fact, I find ants endlessly fascinating, particularly their highly social nature. If you truly want to understand ants, you need to read some of the books written by a fellow named E. O. Wilson. He is the foremost authority on the topic, and I, of course, referred to some of his work in writing my novel. I certainly do not regard ants as a tool of destruction, but I will say, now that you have me thinking about it, I recall being impacted quite strongly a very long time ago (in grade school, I think), by a short story entitled “Leiningen versus the Ants,” published in 1938 by Carl Stephenson. It’s entirely possible that this story — noodling around in my head all those years — is the true germ of the idea that led to World Hunger. There are copies online if you want to check it out. I am one of the students in Mr. Damaso’s Honors English II class reading your book. Your book is mainly focused on the ethical aspect of science and where humanity should discern where these lines are. Where do you stand on the manipulation of the genetic make-up of seeds? Would you eat corn made from genetically modified seeds? What about an animal that has been genetically modified or cloned? To be fair, I don’t have a problem with GM food products per se. It’s pretty tough these days to eat any processed or packaged food at all without getting some GM content, particularly given the pervasiveness of corn in our diets (corn oil, corn syrup, etc.) and the very high percentage of corn that is GM (more than 95%). As I’ve stated elsewhere, my issues with GM have more to do with corporate practices than with the technology itself. I’m not comfortable with threats to biodiversity, and the business practices that allow patenting of plant species and prohibitions on farmers from carrying seed from one growing season to the next. Thanks for writing this book I’ve really been appreciating it so far. I was wondering what function you intended Julia’s son, Harry, to play in the book. Is he used to make Julia more vulnerable or does he have another symbolic meaning? I would classify Harry as a minor character, and he is included mainly to provide a bit of foreshadowing near the beginning (as someone observed earlier) and to add depth to Julia’s character, in particular, to give her an alternative perspective on life aside from the one she is constantly pummeled with at work. I think her motherly instincts are a big part of why she reacts the ways she does to the unfolding drama with Evergreen. She has a level of humanity that Barett, Hansen, and certainly Chase, lack. I was wondering, what steps did you take when writing your novel? Did the idea of genetically modified super bugs come first? Or was there something that you saw that caused you to do more research into GM products? So basically, what went into creating World Hunger? Like most of my fiction (long or short), the start was a single idea (a “kernel” if you prefer, since we’re talking about crops here), that idea being “what would happen if the traits engineered into GM crops (pesticide resistance, rapid growth, etc.) accidentally made their way into the animals that consume those crops?” There was, from the outset, no hard scientific evidence that such a thing could occur, but there certainly was enough extant research to suggest that the idea was at least plausible. And I think it’s the plausibility of the idea that seems to fascinate a lot of people. To give you another example of this kernel concept, the book I’m working on now is based on the single idea, “What would happen if someone trying to escape from the Spanish Inquisition hitched a ride on Columbus’ first voyage to the New World?” (the two historical events took place at exactly the same time in the same place, so, again, lots of plausibility there). I then will build up the idea little by little, first by writing perhaps a one-page overview of what I think the story will be about, followed by designing characters, or taking some from my character library that I’ve described elsewhere. Also, I think because of my engineering background, I tend to be quite organized about the actual writing. For example, I keep a spreadsheet that outlines the chapters, their length, the principal plot development(s) that I want to accomplish and how they contribute to the overall flow, the characters that will appear, etc, etc. That way I can look at the spreadsheet and get an immediate overview of the book’s progress, as well as a sense for whether the characters are rotating into and out of the narrative in a balanced manner (don’t want anyone working too hard!). All in all, for me at least, it’s a pretty structured process. I am also a part of the Brophy English class and I was wondering about what influenced the creation of the fictional corporation Vanguard. With the number of GM foods and crops growing every year and big businesses taking advantage of this, was there a particular corporation you kept in mind while writing the novel? Is Vanguard based off of a corporation in the real world? Thank you! Of course, you’d always love to use the real names of the companies you have in mind for stories like this, but the real companies, needless to say, aren’t terribly pleased with authors doing that, particularly when their actions (either real or imagined) don’t reflect in a flattering way. Strictly speaking, the model for Vanguard could have been any of the large seed companies, e.g., Monsanto, Bayer, Dupont, etc. Monsanto tends to be the best known one, though, and I confess to having that name in my head throughout most of my drafting process. My question is pertaining to the title of the novel. I know that you have already answered what the significance of the title is; however, I was wondering if you had any other possible titles in mind as you were writing? I guess I should first ask if you chose the title before or after the writing process. Thanks for your involvement as we read your interesting novel. And thanks for writing such an interesting novel! In this case, the title appeared fairly early in the drafting process, and I was pretty happy with it from the get-go, for the reasons I’ve explained elsewhere. On the other hand, the title for the next book (Alone in the Light) went through numerous iterations before landing on something I was really comfortable with. I don’t have any hard and fast rule about when to come up with a title. It’s a part of the puzzle that’s always noodling around in the back of my head throughout the drafting process. I usually know when it’s a good one though! On a related note, World Hunger has worked out well as a title from a purely commercial perspective, because the name is also a commonly used phrase that people search for online. So, for example, if someone goes to Amazon and types “World Hunger” into the search bar (without even knowing that I have such a book), my novel is the very first one to come up in the search results. Nothing wrong with that! Your book has been a very captivating book to read among many others. There are only two questions i have: what is your favorite book? and did this book inspire you in any way or have any content that carried over into World Hunger? Wow, tough to come up with one favorite book. I read a lot (mainly fiction when it’s not research for my own projects), and to some degree everything I’ve read plays a part, however small, in my writing. I really like Cormac McCarthy, who I understand you’ve been reading as part of this course. I think his best by far is Blood Meridian. Awful difficult to point to a specific way in which that book would have influenced WH though. Other favorite authors of mine include Jose Saramago, William Faulkner, David Foster Wallace, and Toni Morrison, to name but a few. As you could have guessed, I am also a student in the Honors English II class taught by Mr. Damaso. In class, we recently finished a unit covering dystopic and post-apocalyptic societies. Could you see the GM crops eventually leading to an apocalyptic society by affecting humans rather than mutating insects? Seems a bit of a stretch, though the original premise of the novel could be described as one as well, I suppose. Yeah, if enough bad things happen, particularly to the global food supply, then it’s not hard to imagine a dystopic result at all. You may have caught on the news in the past couple of years a lot of concern about lots of honey bees dying off inexplicably. That’s a big deal, since the bees are what pollinate the plants, which is how they grow and produce food. Who knows, maybe in the next book I’ll have to do something with bees (particularly given my modest childhood trauma described elsewhere in this thread). Your novel seems to have a lot of evidence and examples about GM food. I was wondering if you have had a background working in the food industry or if you have had any experience with GM food, and if not where did you get most of your information? No real background in the food industry at all, other than jobs I had as a teenager at fast food places and grocery stores. Pretty much everything about the industry that’s baked into the novel came from research, either secondary (online) or primary (talking to experts). I was wondering what the most feasible outcome of GM crops would be along the lines of interspecies mutations. You said in an earlier response that giant insects were not the greatest risk, so what is? Also, would the possibility of insects adapting the genetic traits of plants be worth mentioning and would the effects be noticeable, like in your book? This is a tough one to answer, but I think the greatest risk from a cross-species perspective is probably plant-to-plant, i.e., transgenic characteristics migrating from the original/intended plant into other nearby species, either the same plant type or, for example, one or more species of weeds. That then becomes potentially problematic because if the original transgenic trait was, for example, to make the intended plant hardier, then you would make the weed hardier as well, and hence harder to eradicate. This gives rise to so-called superweeds. I’ve really been enjoying your novel so far. It’s been hard to put down, in fact. The characters incredibly realistic. However, I couldn’t help notice that they are predominantly male. Apart from Julia, in fact, I can’t think of any other female characters that are discussed in depth. I was curious as to whether this was intentional on your part. Do you prefer to write male characters? Did it stem from an opinion that the corporate and scientific worlds are predominantly male-dominated? Or was there another reason? It’s an interesting observation and one I’ve wondered about myself from time to time. In particular, it is becoming a serious problem in my fourth novel (currently being drafted), much of which takes place on ships at sea in the 15th century, so not a lot of female opportunity there either! There is a single major female character in my second novel as well (titled Alone in the Light), and she turns out to be a not-especially-likable individual. I don’t really know what this is about, to be frank, but it is something I expect I’ll continue to reflect upon. I welcome anyone else’s thoughts on what might be causing me to operate in this way! Your book lays out the perils of GM food development that is not transparent. It doesn’t necessarily eliminate the thought of GM food. Do you think it would be more appropriate if GM food was developed in a clear environment free of corporate pressure, and was publicly funded? Where do you see the future of GM research going? Should we in the West focus on GM crops when we already have enough food for ourselves? Do we have an obligation to the world? More so, do we already have enough food to feed the world without GM crops, and is it just an economic system that gives unequal share? I understand you’re not an economist or whatnot, but I would appreciate your opinion. World Hunger is a great piece of fiction, and is informing me greatly on GM food. Thank you. While a good deal of the research into GM technology has taken place in the private sector, there has been, as well, a fair bit of research conducted by government organizations (NIH, WHO, etc.). The difference, of course, is that the companies undertake this research because they seek, ultimately, to sell seeds for a profit. Government research, on the other hand, tends to be more about consumer safety and improving the state of the nation’s agricultural capabilities in general. As for whether the U.S. has an obligation to help feed the rest of the world, that’s a difficult moral and public policy question, particularly when you consider that there is no shortage of hungry people here at home. In truth, there is. almost certainly, enough food grown around the world to feed everyone. The difficulty in doing so tends to be more about logistics and politics, the former caused by poor transportation networks in many places, and the latter by despots, warlords, etc., who are not shy about using food as a political weapon. I am a student in Mr. Damaso’s class as well. There seems to be a heavy relationship between the political and scientific groups in your novel. Every action by one side seems to trigger a reaction on the opposite side, and so on. In your opinion, what would the ideal relationship be between scientific advancement and political action in relation to such advancement? Should governments impose tight regulations upon scientific programs like Project Evergreen, possibly limiting them from their full potential, or should there be more ground for the scientists to do what they deem to be best? You are asking about a very subtle and complex area of public policy, i.e., the relationship between government and the private sector specifically as it relates to research. A good example to explore would be the pharmaceutical industry. How much of a role should the government play in the research and roll-out of new drugs? Of course there is no right answer to this, and where you come down depends, in large part, on your politics. The corporate types want to push out new products as fast as they can so as to quickly recoup the vast amounts of money spent doing R&D. The government is at odds with this, because their main focus is on consumer safety, not the company’s bottom line. These differing points of view always put the two organizations at odds with each other. The same is going to be true with seeds, particularly for crops that people eat (as opposed to, say, GM cotton). Thus, the nature of the regulatory regime will be a function of the political parties in power at any given time, with left-wingers tending to side with the regulators and right-wingers focused more on the corporations. Before I ask my question, I would like to applaud you on this book. I am enjoying it very much. I was curious about what the “gardeners” used to destory the field crops- the rake. Did you come up with the idea or was it already an instrument used by crop corrupters? And if you came up with it, where did the idea come from? First, I will take full credit for inventing the “the rake.” I have not heard of such an implement being used in a role of this kind, though I continue to think it would do a nice efficient job of things. Tough to say where the idea came from. I am an engineer by training, and I’ve been around mechanical devices pretty much my whole life. And while I don’t do a lot of automotive work, I am certainly familiar with the workings of cars and trucks, enough to realize that an old drive shaft might serve well in this unorthodox role. Keep in mind that the folks engaged in these activities, particularly in a relatively poor country like India, would not be working with large budgets, meaning that they would want a solution that was simultaneously easy to use, time-effective, and inexpensive to put together. Sounds like you’re alluding to some of the more graphic descriptions, like, for example, the scene in the Indian corn field. Chalk it up to reading too much Stephen King, I guess! Seriously, I’ve read a lot of horror stories in my time, and it seemed like an interesting chance to try a hybrid approach by combining those sorts of graphic descriptions (in limited quantities, of course) with the more technical details of the technology. I hope the approach works and doesn’t put off too many people. When reading the descriptions and reactions of the people who come in contact with the super-insects that Vanguard created, I cannot help but wonder if some might use the insects to their advantage. I was thinking that people could possibly use the ants in a for of weapon. Is there any particular reason that i have overlooked that makes this idea invalid? It’s an interesting angle that, to be frank, did not occur to me in the course of writing the story. Of course, in the early going, no one really knew what was going on in the fields. But once the meetings with the government started happening, it certainly could reasonably have occurred to more than one politician that this would be a possibility. There exists, however, the all-important issue of control. It’s not as though you can just set loose a giant swarm of cutter ants in your enemy’s backyard. Creatures in nature tend to go where they want, so effective use as a weapon would, seems to me, be fraught with all sorts of potentially bad outcomes (and not just for the bad guys). It’s an interesting thought for a sequel though! How goes it? I’ve really been enjoying your book, but i was wondering, when the fellow “gardeners” watch their friend die, does this show that in their society food plays a greater role than human life? I don’t think that the gardeners’ reaction to the fate of their colleagues in the garden in India is quite as complex as you’re suggesting. I think it is just good old fashioned fear that keeps them from running back out into the corn to help their friends. It’s not as though they’re sitting on the sidelines saying “well it’s all for the good of our cause” or anything like that. Remember also that the scene takes place at night in an area they’re not terribly familiar with, so a fair degree of confusion is to be expected, particularly considering how unexpected the events of that evening are to them. I am a student in Mr. Damaso’s class, and all the different characters that you have created captivate me as a reader. My question to you is… Are any of these characters based off of past co-workers or bosses? Your characters seem far too complex to just be fictional. Can’t say that I based any of the folks in WH on actual people I know, though there are certainly elements of some of my friends and colleagues (including a couple of pilfered names) in the story’s characters. I am pleased that you find the characters complex. It is a common complaint among commercial fiction readers that the stories are too plot-driven and lack believable, in-depth characters. As I mentioned briefly elsewhere, one of the techniques I’ve used for some time is to create characters apart from a specific novel by employing a template of about 30 questions I force myself to answer about each fabricated person, including, for example, everything from their age and appearance to their education, favorite foods and music. This helps me to fully “know” the character, even if all of their various traits don’t ever make it into the story. So, for example, the fact that Julia was originally from Austin, Texas and secretly loved country-western music was just a small trait of hers that I felt made her a bit more human, even though it doesn’t contribute to the story in any meaningful way. I’m really loving the novel. It’s a true page-turner. I have a question about your purpose for the book. In history class, I learned that Mary Shelley’s “Frankenstein” was a reactionary novel to the Scientific Revolution. A theme of that story (I assume you already know) is that human interaction into the natural sciences can create literal and figurative monsters. Do you believe this “Frankenstein idea”? Also, do you think of your novel as a science fiction thriller or a cautionary tale? Great to hear you’re enjoying the novel! Interesting that you chose this example as a point of comparison. As you’ve doubtless discovered from searching around on-line, one of the most popular pejorative terms used by the anti-GM crowd is “franken-foods.” And yes, I do believe that as humans dabble increasingly with various types of natural systems, there is ample opportunity for unintended consequences (some of which, by the way, could turn out to be accidentally beneficial — remember, the discovery of penicillin was a scientific accident). However, there is also plenty of opportunity for messing things up, particularly as we get more deeply into molecular biology research and, ultimately, the creation of synthetic life (closer than you think). I don’t regard WH as a science fiction novel. If I had to categorize it, I’d go more with a term like techno-thriller, sort of along the lines of Jurassic Park. And yes, certainly, I hope it serves as a cautionary tale. As I continue to read your book, it is evident that corporate culture plays a large role in the development of the story. I appreciate that your book does not have a political agenda, as described in the introduction, but I would like to know how you feel about the industrialization and growing control of corporations such as DuPont and Monsanto over farming. Do you think it is good that this system is being used to create more food for the world’s population, or do you think the setbacks (such as possible environmental damage, job loss for small farmers, dependence on faceless companies for food supply) outweigh the advances that have been made in farming technology? An extremely complex question and one I cannot hope to do justice to in this space. As you suggest, very large biotech companies now exert a terrific degree of control over the world’s food supply. And the companies, by the way, are only getting bigger as there has been an enormous wave of industry consolidation in recent years. No, I do not believe that such monolithic control over the food supply is a good thing, particularly when it comes at the expense of small rural farmers who are forced to sign seed-use licenses, pay exorbitant amounts to purchase the seeds they need, and are prohibited from reusing seeds in subsequent years’ crops. Remember though, corporations have one over-riding focus, and that is the maximization of profit for the benefit of shareholders. They are not, strictly speaking, in the business of feeding the world’s people, unless of course that activity translates into said profits. I don’t say these things to be cynical or anti-capitalist, only to provide real-world context for how firms operate. Hello Mr. Swain, I am a student in Mr. Damaso’s English class. As I read the novel, I’m caught wondering a little about Vanguard. Is Vanguard a company of pure fiction, or could it be viewed as symbolic of a cooperation of today? I keep wondering whether actual GM crops have failed and produced negative consequences, and if World Hunger is an allegory against growing GM food. Vanguard is not a genuine corporation, but is certainly modeled on one. You can choose any of the large GM-seed firms you care to (Monsanto, Bayer, Dow, Dupont, etc.) — they all must deal with the same issues faced by the fictitious company in WH. When you ask about whether actual GM crops have “failed,” that could mean a lot of things. There have certainly not been events of the sort described in the novel (or if there have, it’s been kept awfully quiet!). There have, however, been plenty of situations where, for example, GM crops have bled unintentionally into nearby non-GM fields through the effects of wind, water, birds, insects, etc. Indeed, one of the biggest challenges associated with the technology is keeping the plants in only the intended locations. There was also a big issue some years back that made a great deal of news, i.e., the claim that GM (Bt) corn was killing monarch butterflies. This ended up with a bit of a fizzle though, once it was determined that monarchs in the wild do not come anywhere near corn plants unless deprived of all other food sources, and that they would need to ingest enormous quantities of the corn in order to be adversely affected by it. How long did it take you to write the entirety of World Hunger? This could also include research and character development done outside of the novel. Thanks for taking your time to answer all of these questions! P.S. I am really enjoying World Hunger. It’s a bit tough to put actual numbers on my writing time, as I tend to bounce from one project to another rather than sticking to one until it’s concluded. That said, I would estimate that the entire drafting process for WH took about 6 months, not including a couple months of reading and researching beforehand. Of course, once the draft is done, there is invariably another extended period of time spent editing, in this case perhaps another couple of months. As long as we’re on the general topic of writing, a bit more about my personal habits. I am not nearly as disciplined about it as you will hear from many other authors. But, then, I have that luxury because I’m not doing it to make a living. I write almost exclusively in the late evenings (not a morning person at all), and I tend to do it in what I would describe as a quite “bursty” manner, meaning that I frequently go long periods without writing anything at all, but then I’ll suddenly crank out 20 or 30 pages in a single sitting (once the inspiration hits). It’s also helpful that I enjoy writing not only long fiction, but short stories, essays, and poems as well. That way, if something is not working in one domain, I can always switch gears onto something else. First of all I would like to congratulations on World Hunger, I find it an extremely well written and intriguing novel. I am a current Brophy Student in Mr. Damaso’s class and I have a question about the book. When writing it, did religion ever influence you to favor one party in the book? If so, which party did it influence you to favor? To be honest, there is no significant role played in the story by religion, either from a thematic standpoint, or as an influence on the views of any of the characters. Indeed, now that you mention it, I don’t know that the subject ever even comes up in conversation (although, as it happens, I’ve solved that little problem with my third novel (working title – Sistina), which deals very heavily with religious themes). I also am a student of Mr. Damaso’s English class reading your novel. I found World Hunger to be intriguing, full of description and suspense, and different. In your introduction you mention that you believe GM has a great deal to offer to humanity. Do you express these things later in your novel? These views are espoused periodically throughout the novel, most notably in the opinions and statements of Barett (for example, during his university lecture), and in the personal views of people like Julia and, to a lesser degree, Mandell. Chase frequently touts such benefits too, but his viewpoint is quite a bit more suspect, given that he is focused almost exclusively on corporate profit. What you end up with in the story is a wide range of (pro and con) views on the technology, driven, in turn, by a wide range of personal and organizational agendas. I am currently reading your book for Mr. Damaso’s English class. I have really enjoyed reading your book as it is truly very captivating and interesting. However, one thing that i really thought was interesting was all the protests and against the GM crops as well as the outright destruction of the crops in chapter 21. Was that all stuff that you researched or have you ever actually participated in protests similar to the ones that you wrote about in your book? I have never been much of a protester sort myself, though I have several friends who enjoy it. I’ve also never taken part in the sort of crop raids described in the story. To the extent that this latter activity still goes on, I suspect it takes place in other countries more so than in the U.S. where GM crops are now very mainstream (e.g., >95% of all corn and soybeans grown in the U.S. are some form of GM). So, yes, there was a good deal of research involved in learning about these activities, including talking in depth with some of my friends who have been closer to it. Hello, I am also a Brophy student reading your novel. I was wondering why you chose to use so many different perspectives in your novel? Your novel allows the reader to jump into the minds of not only the main characters, but also minor characters. I think it is very unique to read chapters from the perspective of the spider bite victims and even the ants in chapter 20. Why did you chose to include chapters from the minor characters perspective and what do you feel it adds to your novel? Thank you, I am really enjoying your book. There are a lot of different things taking place throughout the story, frequently in widely varying parts of the world, and I think it is useful to understand these events from the perspectives of the individuals most closely associated with them (rather than, say, from the point of view of a single omniscient observer/narrator). The challenge, of course, is making the narrative threads hang together when you have several different people (or non-people!) contributing their perspectives to the book. I am a student of Mr. Damaso reading your book. I was really thrilled reading the scenes with vivid descriptions and details of insects tearing people apart. I was wondering if you ever had a bad experience with insects and if your experience led you to write these particular scenes so vividly and clearly. I refer you to my response to Ben Epstein below in which I describe an unfortunate incident that occurred when I was a very small child! I am currently reading your book for Mr. Damaso’s English class. Your book is a very interesting portrayal of GM crops gone wrong, but the risk from GM products seems slightly over-exaggerated to me. Genetically modified products, like corn and soybeans, were introduced into U.S in the 1980′s, so we’ve already been eating these products for almost three decades now. Also, without such genetic modification, such high crop yields would not be possible, and meeting food demands for rising world populations would be increasingly difficult. I’m not saying there aren’t potential risks, just none that in the last thirty years would change my mind from supporting the genetic modification. So, I guess my question is, do you feel the potential risks are really serious enough for this to even really be a controversial issue, seeing as no major problems with GM’s have thus far outweighed the benefits? In large part I agree with your position. If there’s a risk issue with GM technology for me personally, it has less to do with human health, or even the horrific sorts of events depicted in the novel. Rather, the risk is to biological diversity, i.e., inadvertent spreading of GM species due to wind, water, animal ingestion, etc. Indeed, even now, in many countries that allow the planting of GM crops, there are required buffer zones of non-transgenic plants, to help isolate the non-GM species from the GM ones. I am also not especially comfortable with the corporate aspects of the technology, e.g. forcing farmers to pay license fees for use of the seeds, taking out patents on biological species, etc. I do indeed think there is enough unknown about the technology and its implementation to easily qualify it as a “controversial” issue. Apparently the entire continent of Europe agrees, since, despite widespread adoption in other parts of the world, Europeans remain highly skeptical and very averse to not only planting GM crops but even importing ones grown elsewhere. I am a student of Mr. Damaso and throughout the novel there seems to be a recurring theme of the dangers of these genetically altered crops. I was wondering, did you write the novel as a warning of these dangers or simply for entertainment purposes? In all of my long fiction (three completed novels; two more in the works) I endeavor to combine entertainment with a strong element of education. I think that “warning” would probably be an overstatement in this case. I prefer to think of it as making readers aware of the various issues attending GM technology so that they can come to their own opinion regarding its research, testing, regulation, and pros/cons. I am currently reading your book and am a student in Mr. Damaso’s class. In my opinion, your book is very interesting and intriguing. Authors often create a character in their stories that they sympathize with and can connect to. I would like to ask if there are any characters in your novel who you relate to at all or think you are similar to and why. Thank you. At some level I think an author relates to all his characters. Otherwise it’s pretty tough to make readers care about them, which is one of your primary goals as a writer. For me and this particular story, though, I probably relate to Barett the most. In fact, there are a few minor autobiographical elements of his character that came directly from my own life (the car, the dog, etc.). As I mentioned someplace earlier, I spent a lot of time in the corporate world and I know what it means to have a boss who is unreasonable, tyrannical, etc. You mention sympathy — I also feel quite a lot of sympathy for Julia in the story, particularly given the betrayal that she undergoes later in the story. I think that out of all the characters, she has the deepest empathy and concern for the calamity that their research causes. I am a student of Mr. Damaso. I think your book is great. It is interesting, insightful, and suspenseful. I wanted to ask how you got into writing. I also would like to know if you have any advice for people who want to write as a career? Thank you. I have been writing seriously for about 10 years, and I spent a good deal of the “early years” focused almost exclusively on poetry. But for a long time the basic idea behind World Hunger noodled around in my head without my ever sitting down and having a go at it. Then around 2005 (thanks in an odd way to one of the main consequences of being laid off from a job, i.e., suddenly having lots of free time), I decided to take the plunge and start writing WH in earnest. It took about 9 months, including both the research and the writing. As for advice — wow, that’s a topic worthy of its own essay. But a few points are worth highlighting. First, read everything you can get your hands on. Virtually every writer I’ve ever talked to says that copious reading is one of the foundational things they do. It’s how you get ideas, learn different writing styles, and become a more discriminating (as opposed to casual) reader, which, in turn, givers you a better sense for what sounds good in your own writing. Second, write because you love it, not because you think you’re going to make lots of money at it. Not to put too much of a downer on things, but the odds of becoming a world-famous author (e.g., Stephen King, J. K. Rowling, Dan Brown, et al) are somewhat less than the odds of being chosen to play quarterback for your favorite NFL team! But, having said that, no one has success as a writer who doesn’t sit down and do it. If I had a nickel for every person who I’ve heard say “I always wanted to be a writer” but who has never sat down and tried it, I’d be retired by now. Third, I would also say that in addition to reading the work of others, read as well the many books and essays out there on the craft of writing. You will eventually develop a style of your own (your “voice”), but first you have to understand the “right” way to do it. In order to earn the right to break the rules, you first have to know what they are! Hello, I am a Brophy student as well. As I was reading the book and looking at the personalities of each character, I kept wondering one thing. Why did you choose to make the CEO Chase and Barett have contrasting personalities? I have spent quite a lot of time in the corporate world over the past 25 years or so and I’ve encountered both of the personality types you see in Barett and Chase. I believe that having widely divergent character types in a story makes for much more interesting and believable conflicts, and conflict is a big part of what makes any good story hang together. I think you would agree that if Chase and Barett had similar outlooks on things, the nature of their interaction would be a good deal less compelling. My name is Adam Lincoln. You probably already guessed but I am yet another student in Mr. Damaso’s English course and I am reading your novel. I think it is a very intriguing novel and I have enjoyed all of it so far. One question I have regarding your novel is about the setting. Why did you choose to have most of the insect related disasters occur outside of the United States? The cutter ants, fire ants, and army worms abroad seem to be doing the majority of the damage throughout your novel, even though about halfway through the book the focus seems to be switching to the spiders in America. Were you trying to show America’s affect on people worldwide or did you have another motive for choosing these setting around the world? Interesting question when you put it that way. I can’t point to much rationale for why most of the “action” takes place outside the U.S., except perhaps because Vanguard would have preferred to do their large-scale field testing in these international locations to avoid the presumably greater regulatory scrutiny of doing it domestically. It was definitely not intended (at least not intentionally anyway) as a statement on American companies exporting damage to other countries, though, upon reflection, there is likely an element of truth to that. In general I just enjoy working a plot in multiple locations at the same time. Makes it more interesting if there are several different cultures taking part. I am yet another student in Mr. Damaso’s English Class. I am really liking the book and have a question for you. Have any of your eating habits changed while doing your research of GM agriculture? As our class has been noticing, large corporate companies are putting extreme amounts of technology and chemicals into our crops and I was wondering if reporting on this and seeing it all first hand has changed anything in the way you consume food? Short answer is no. I firmly believe that if you dig deep enough, you can find some compelling reason why you shouldn’t eat any food that’s for sale anywhere! That may sound extreme, but if you think about it, that item you’re considering in the grocery store may be GM, it may have been grown with pesticides and/or laced with chemicals, it may have been harvested with exploited labor, it will almost certainly have been transported using fossil fuels, etc, etc. I don’t pretend to preach to anyone else about what they should eat, but I would drive myself crazy if I started analyzing every facet of my dietary choices. While looking through this website I found that your books/poems are on a wide variety of things. I was wondering why you choose to write about so many different things instead of just sticking with a single subject like some other authors do. I realize you are not the only one who does this but I was wondering if it has to do with your personality or what. Friends and relatives who know me well would probably just tell you that I have a short attention span! But seriously, I am interested in many different topics, as you can tell from looking through the site. One of the things that happens frequently to commercially successful authors (into which category I cannot yet count myself) is that they get pressured by publishers and agents to produce the same sort of stories over and over (the poster child for this would have to be John Grisham with his lawyer novels). Book publishers aren’t interested in the author’s growth as a person or even their degree of satisfaction with their work. They are only interested in selling books. And once an author has staked out a particular space (like Dan Brown did, for example, with The DaVinci Code), there is terrific pressure to stay in that space, because it makes the audience predictable for the publisher. It’s quite rare to find a well-known writer who writes about all sorts of different topics in many different styles. Our school recently had a serious of speakers come to talk about food, with one of the main focus points being GM food. One thing that I heard was that, regardless of the ethics of GM food, it will be necessary to feed the growing world population. Do you agree with this? Will GM food be absolutely necessary in order to produce enough food for the world? Thanks. You actually are asking two different questions here. Will it be challenging to feed the world’s ever-growing population? Absolutely, and there is an entire essay I could do just on this topic (sample issue to think about — Does it make good public policy sense to make fuel from corn?). Your other question — Is GM technology required to feed this growing population? That’s a much thornier issue, and one I hope I at least introduced in the novel, without necessarily resolving it. I am of the belief that GM technology will play (indeed already is playing) a necessary role in feeding the world. That is why I tried to emphasize in the book’s introduction that having a generally negative attitude toward this technology may turn out to be an untenable perspective. On the other hand, that key role does not obviate, for a moment, the need to be thorough and judicious about testing and regulation of what is still a very new technology. I am currently reading your book in Mr. Damaso’s Honors English Class, and I am enjoying it. I just wanted to know if you have ever been to any of the countries that the testing sites are in, and if you have interacted with any of the people there to get a better sense of the inhabitants natural behaviors and what their reactions would really be like? I have, unfortunately, never made it to South America, though I would very much like to do so someday. I do have a number of friends from Colombia and other SA countries though, and I have a pretty good feel for how they react to different situations. As for India, I have spent some time there, besides which I also have a large number of Indian friends. I am even more familiar with this culture than is the case with South America. In fact, the Indians who feature in the story are modeled (loosely) on specific Indian people that I know. To your general point, I do think that writing about locations tends to be much better when you’ve actually spent time in the area. That said, I get a lot of mileage out of online research and spending time with locals, even if I can’t travel to the distant location. Among greedy corporate suits, rabid environmental activists, and carnivorous insects, scientists seem to be the only level headed characters that readers can relate to. While your respect for science is evidenced throughout the novel, I am curious as to where this esteem came from and where it took you career-wise. As you suggest, I have a profound respect for and interest in science. I am an electrical engineer by training, and was drawn to math and, in particular, physics when I was in high school (never was much of a biology or chemistry type). A lot of my fiction has a strong science angle to it, and, in fact, my favorite commercial fiction writer is almost certainly Michael Crichton, the fellow who gave you Jurassic Park, Andromeda Strain, and many other science-based novels. As for where my love of science originated, that’s a tough one, except that I would point to a couple of specific high school teachers who can probably take some of the credit. Another one of Mr. Damaso’s students. Like some of the others have said, the book is written in short chapters, often jumping from location to location. I find it very fun to read this way. Each chapter is like a scene in a movie. Would you be open to a movie adaptation of your book in the future? There is something inherently disturbing (and interesting) about human-devouring ants and cat-sized spiders which could work well in a visual format. Your story is very relevant in today’s world and is infinitely more thought-provoking than typical creepy crawly movies. Now you’ve gone and said the magic word! (film, movie, take your pick). Of course, I’d love to see the story done for the screen. I believe that many of the scenes would translate very well into that medium. Quite a few readers have suggested that the short-chapter format would lend itself readily to a screenplay. I haven’t gotten that call from Steven Spielberg yet, but you never know! As you were brainstorming and writing this novel, what other side effects of the Project Evergreen did you have in mind? Were any of the insects or arachnids personally involved in your life? I pretty much decided from the outset that the out-of-control insect situation was going to be the focal point of the novel. That said, there could, of course, have been myriad other effects from the GM technology that I might have had some fictional fun with (and which – who knows – may yet play a role in a future sequel). For example, there could have arisen a situation in which people suffered some sort of health problems, or there might have been more subtle problems like genetic damage to bees, rendering them incapable of pollinating plants, which, in turn, could have threatened the world’s agriculture. Like most people, I’ve had plenty of exposure to insects throughout my life. In particular, I am no fan of spiders, particularly the big hairy variety! I am, on the other hand, endlessly fascinated by ants, and I find it interesting to watch their activities close-up. They are very social creatures, discussed most eloquently by the naturalist E. O. Wilson, whose books I cannot recommend too highly. In fact, he recently wrote his first novel on the topic of ant society, entitled Anthill. Check it out sometime. I am also currently reading your novel for Mr. Damaso’s Honors English II course and to this point I have greatly enjoyed your novel. I noticed that you have an extensive background in poetry writing, and I was curious whether you yourself personally enjoy writing poetry more or creating fictitious novels? I was also wondering if your background in poetry had any effect in the writing of this novel? Can’t say that I have a particular preference for any one type of writing. I do a fair bit of poetry, fiction (short and long), and essay writing. I think, to some degree, the experiences of each affect the others. In addition, if I find myself especially unproductive in one domain on a given day, I can usually revert to another type of project and keep plugging away. I have been on a bit of an essay “kick” in recent weeks, and you’ll find numerous examples in that section of this site. I can’t really say that my poetry background had much direct effect on the writing of World Hunger, aside from contributing to my overall writing “voice,” hopefully in a good way. Now that you mention it, odd that I’ve never written a piece of fiction in which poetry played an explicit role. I may have to do something about that! I am extremely enjoying your book, and the issues and themes that are presented throughout. I was just curious because of the subject of killer insects, did you have personally have run-ins with insects that provided inspiration for the the different attacks in the novel? Interesting question, and one I had to think about for a bit. The only recent such experience I can point to is my more-or-less daily conflict with fire ants, which is a fact of everyday life here in Texas. However, way back when I was three or so, I was out in a blueberry field with my mother and I somehow managed to fall into a hole that had a hornet nest at the bottom. As a result, I was stung several hundred times. That experience, though I don’t actually remember it, may have had an impact on my later life. Oddly, though, I did not choose to include bees or hornets in World Hunger. Perhaps they will figure into a sequel! I am a student in Mr. Damaso’s Honors English II class and I am currently reading World Hunger. I have enjoyed reading your novel so far. There are many details that are intriguing such as the passing of genes from plants to insects. Although, I do have a question about how you chose your characters and the insects. Did you make an evolving insect for a relation to a character? For example you created monstrous banana spiders because Chase was already fascinated by spiders. The characters were chosen (or their respective roles, at any rate) to fill the respective positions that one would expect to take part in a drama of this sort, e.g., the scientific types (Julia, Mandell), the corporate types (Chase, Barett), the government types (senators, WHO Director), and the activist types (Hansen). As for the selection of insects (out of the millions of possibilities), I was looking for types that already demonstrate particularly aggressive behaviors (either to other animals or to plants) under normal circumstances, and which also could be relied upon to interact in some way with the test crops, so as to plausibly become exposed to the genetic enhancements that are the story’s foundation. Were their any specific, personal experiences that you put directly in the book such as a conversation or sequence of events? Short answer is no, but I wouldn’t be much of a writer if I left it with the short answer. In fact, even though I have no real personal experience with the GM field, there are several scenes where it was possible to incorporate a few of my own personal experiences. I have, for example, spent a good part of my life in and around airplanes (including 6 years in the USAF) and much of the description of aircraft comes from my own direct experiences. Also, the scenes involving fire ants are pretty true-to-life, since I live in Texas where these little varmints are an everyday part of our existence! (though, mercifully, not on the scale of what happened in Ecuador). I am also deathly afraid of spiders, which is why I made a point of including them as an important element of the book! As I was reading World Hunger, I was almost furious at Vanguard for their delay in confronting the situation. I would assume that when people and animals are being devoured by ravenous ants, the government would have some back up plan in place. When the Vanguard scientists are searching for a solution, it appears to me that they try to confront the situation in a relatively dilatory manner. As I am reading this (I am at about page 200) I can’t help but think back to the BP oil spill. In that situation the federal government basically let BP take care of the clean up process. Besides their interrogation in the Senate, it seems as if the government is taking a back seat role in the GM disaster also. In your opinion, what role should the government play in containing disaster scenarios brought about by corporations like Vanguard, and in this scenario how would you have wanted the regulatory institutions to act? You raise a very tough question, and one for which I don’t have any great answers, I’m afraid. There have been numerous corporate-driven disasters over the years (e.g., BP, Tylenol, Exxon Valdez, and, of course, no shortage of food-related events that injure and sometimes kill people), yet, amazingly, there exist no standards for the level or timing of involvement on the part of governments. Such involvement tends, instead, to be driven largely by the publicity attending the event, which, in turn, is often a function of the short-term (as opposed to potential) impact. So, for example, when you have, say, a food recall because people have been poisoned, the government tends to get involved quite early. On the other hand, an event like the one portrayed in World Hunger, where the specific incidents ramp up at a rather slow pace, and on a global basis, governments tend not to know quite what to do, as was evident during the hearing that Mandell and Barett attended midway through the story. As I said, a very complex topic and one admitting no very satisfying answers. I am also a student of Mr. Damaso’s English class that is currently reading your novel. I just want to say that I really enjoy the book so far. I can’t help but notice the very small chapters and sudden changes of areas of focus, which don’t bother me. I’m wondering why you choose to write like this with these short chapters as opposed to many other writers who use long chapters and more gradual changes of focus. If you were inspired by another writer to write like this, then who? I am a fan of this sort of writing, and I think I probably get it from a combination of my favorite commercial fiction writers–guys like Stephen King, Tom Clancy, and Michael Crichton, most especially the latter. The most important reason for the short (hopefully punchy) chapters is that I think it keeps the reader’s attention as the plot develops along multiple dimensions simultaneously. Of course, I can only react to the sort of writing and formatting that works for me as a reader. I’m sure there are others who find this technique a bit nerve wracking. On a less important note, I think there are a lot of readers out there who read only in small doses, like before they go to sleep or whatever. I always find it a little annoying to have to stop in mid-chapter, so hopefully having short chapters helps in this (less important) regard as well. I’m yet another student in Mr. Damaso’s Honors English II class at Brophy with a question about your book. I’m finding your book extremely interesting, but I was curious as to why you chose (to put it bluntly) giant insects as the main “side effect” of the genetically modified crops. For example, did you feel it would be the problem that would reveal the most about the risks of genetically modified crops, or that it would be the most captivating? Actually no, I don’t for a moment consider the creation of giant insects to be the greatest potential danger of GM technology. It’s not even clear that it presents such a risk at all. I simply chose it as a fictitious device that would make for (hopefully) an interesting story (even if the premise was a bit far-fetched), and one I could use to introduce the many genuine potential consequences of the technology. The fact that such an outcome is at least scientifically plausible makes it, I think, that much more compelling. And the plausibility angle is why I only went with insects that had grown a modest degree, as opposed to some enormous 1950′s B-movie bugs-the-size of buses approach! I am also in Mr. Damaso’s Honors English II course, and I currently reading your book and thoroughly enjoying it. The characters are dynamic, intriguing, and relatable, and the plot gets better and better as I read further into the book. I did have one question, though, regarding the way you began the novel. You chose to insert a prologue that depicted a scene in which Barret is being tried by Senator Rappaport for a seemingly monumental offense. We did not know exactly what Barrett did at that point in the story, but we had a general idea. Using our brief knowledge of the book’s plot, we could deduce that this man’s GM crop testing had horrible consequences; this is why he was being tried in court. In short, it could be gleaned from reading the prologue that Barrett was in some sort of huge trouble because something went wrong with his environmental experimentation. Why did you decide to start off the book by telling us exactly how it will end? Was this done in an attempt to keep our minds off of the tangible, physical results of GM crops so we could focus on different ideals and controversies behind the usage of GM crops? The primary reason I went with a prologue was to establish from the outset that something pretty bad had happened, something whose consequences hadn’t yet been fully dealt with. In this way, I hope to engage the reader from the very beginning. Of course, you don’t get any real detail into the story-to-come from the senator’s questioning of Barett, only the sense that whatever they attempted went horribly wrong. In my subsequent two novels (one being published any day, the other drafted and waiting its turn in the queue), I also use prologues to similar purpose, though only readers can objectively determine whether the device is an effective one. As a general rule, you want to “grab” the reader as soon in the story in the possible. Hopefully this is one way of accomplishing that goal. I am currently reading your novel for Mr. Damaso’s Honors English II class. As I was reading your intriguing novel, I had one question running through my mind. This question was how did you get to become so knowledgeable about the process of Genetic modification. As I read this book I notice some extremely descriptive dialogue and scenes concerning the idea of Genetic Modification. How did you get to become so smart when it came to the idea of GM? Also, what encouraged you to write about such an intriguing topic? Again, I truly enjoy your novel and cannot wait to see how it ends! Thank you so much for your time! Okay, confession time! I actually do not know that much about biology at all. In fact, it was probably my worst subject of all in high school. I am more of a math/physics sort of guy. That said, the subject of GM has interested me for a very long time, though probably more the societal and public policy aspects of it than the pure science. Still, I felt that if I was going to write a credible story with GM as its foundation, I needed a reasonable degree of technical background. So thank goodness for the internet! The fact of the matter is that in this day and age you can make yourself an expert in almost any topic in a few days of intensive research. Needless to say, I spent many hours online scouring for papers, books, journals, etc. on GM technology and absorbed as much of it as possible before launching into the drafting process. As it happened, during the writing of the story, still more technical issues arose that required me to stop for a bit and research those as well. I actually enjoy the research of my writing a great deal, and I include a detailed source list at the end of the book for those interested enough in the topic to want to follow up on their own. I have a question that steers away from the theme of the precursory questions. I see you have grown up in Maine, you currently live in Texas, and you’ve served in the air-force. I have realized subsequently that a writer’s emotions affects a writer’s decision, even if subconscious, but I am wondering, while writing your page-turning book, do you relate any personal ties into your plot line that might affect certain outcomes? I believe it’s inevitable that any writer brings a certain portion of themselves into their work, however subtle those relationships may be. In WH, I don’t think the personal ties are so much related to the plot as they are to the individual characters. I’ve commented in other answers about certain minor ties between Barett and myself, but I think there are, as well, elements of my own experiences in Julia’s life, particularly her struggles with the corporate world (having come out of academia), her early concern over the effects of Vanguard’s GMO work, and her ultimately failed relationship with Hansen. I am another curious student in Mr. Damaso’s English Class and I have a question about the format of your novel. We just finished The Road by Cormac McCarthy and the formatting and the non-use of punctuation almost seemed to relate to the fragmented world they were in. How did you decide to format the novel and your writing when creating World Hunger? Is it related to the novel in any way or was it just a random decision? Thank you, and I would definitely be reading this book of out enjoyment if it wasn’t a school assignment. Excellent to hear that are getting a chance to read some Cormac. I am a huge fan of his work and I regard him as one of the finest living authors. And yes his formatting, lack of punctuation, etc. take a bit of getting used to, but, in my experience, one gets the hang of his style quite quickly. Almost makes you wonder why everyone else feels the need to punctuate dialog. The only real formatting decision I made on WH from the outset was to go with short, easily digestible chapters. I feel it makes the story flow with a good deal more intensity, particularly given that each chapter takes place in a very different location. I think it keeps the reader more engaged. I am currently, like all of the other students posting on this page, reading your novel. I am really enjoying and find it incredibly interesting. The characters are very well depicted and I find it easier to relate with them with more ease every chapter. Not only is your knowledge of the topic and writing ability incredible, but the way you express your characters emotions and connect with your reader on a personal level by presenting a common ground between the readers and the characters is also superb. As you correctly deduce, I am not normally given to including much romantic content in my work. It is, as you suggest, not really my thing. However, the relationship you ask about does play rather an important role later in the story, so I will hold off answering your specific question for now, because I don’t want to ruin some of the fun to come! I am one of the students in Mr. Damaso’s Honors English II class reading your book. I have a question concerning the book. Early on in the book Julia’s son Harry has a run-in with some fire ants that bite at his hand which leave him crying in tears and his hand red and swollen. Then, later on in the novel some of Hansen’s crew gets devoured by ants. Where you intending for this to be foreshadow or did it just happen this way? Also I would like to know how you picked the order of the insects you introduced in this book? Yes indeed, Harry’s little run-in with the fire ants near the beginning was intended to be an early indication of where the story was headed. Possibly not the most subtle use of foreshadowing in literature, but an attempt nonetheless! I can’t say that there’s much rhyme or reason to the order of appearance of the insects, though their selection was based on an attempt to demonstrate a widely varying range of potential outcomes from the GM transference. In the case of the cutter ants, the effects were potentially harmful to both animals and crops. The spiders, on the other hand, posed no significant agricultural risk, but were, of course, extremely problematic for people and animals. And the caterpillars/moths, while not exactly the “star” of the show, narratively speaking, presented arguably the greatest long-term threat of all in their capacity to wipe out enormous swathes of crops in a short time and, as well, to move the farthest and fastest. The gleaners we are examining are mostly poor people who will enter fields and collect any crops left behind, or in some cases, will collect crops that are still growing. The scientists in your novel are being very thorough in destroying the test crops, though I was wondering if you had considered a story in which one of these gleaners consumed a test crop and experienced similar side-effects as the insects. Thanks for the clarification. Of all the different potential scenarios I have thought about as possible sequels, direct GM effects on people as a consequence of crop ingestion (either intentional or accidental) had not factored into the equation. It is an interesting possibility though and I will have to give it a bit more thought! I am a student in Mr. Damaso’s Honors English 2 class, and I am currently about half-way through your novel. It is a very interesting topic, and very creatively presented. At the moment, we are learning about food, and about gleaners who take excess crops from fields in France. Do you have any plans for a sequel in which the effects felt by the insects were felt by gleaners in the area? Not sure I quite “get” your notion of gleaners. Can you explain a bit more what you mean by this? As for sequels, I have a new novel due out any day, but it is not on this topic, and certainly does not qualify as a sequel. I have, however, thought quite a bit about a follow-up novel on something related to GM, though whether I would revisit the same characters, etc. is not yet clear. I’ve got quite a number of other projects in the pipeline at the moment, so any sequels won’t come for a good while, I’m afraid! I was just curious if the event that took place in your novel about the spiders escaping from the banana plants on the plane and killing the crew was influenced at all by the film Snakes on a Plane. As I read the chapter, the movie and Samuel L. Jackson constantly appeared in my head. I am currently reading your novel and can’t seem to put it down. Afraid to say that there was no influence from S.O.A.P. on my novel (though I have subsequently seen the movie). I do, though, much enjoy writing scenes that involve aircraft, as I spent 6 years in the Air Force, many years doing volunteer work with a group called The Commemorative Air Force (CAF) restoring a WW2 B-17 bomber, and have been around aircraft, in one capacity or another, for pretty much all my adult life. This likely shows in the writing where aircraft are involved in some way. I was wondering whether or not you based EarthAlert on an actual environmental activist group? I am enjoying your novel and I was just interested in knowing if there was an actual large scaled group like EarthAlert who sabotage GM test fields. EarthAlert is, in fact, based on numerous real groups that undertake the sorts of activities described in the novel, i.e., destroy GM crops, conduct demonstrations against seed companies, etc. The real challenge was coming up with a fictitious name that isn’t currently in use. Believe it or not, nearly every combination of “earth” and other words like “watch,” etc., was, in fact, a real group, so conjuring up one I could use took a bit of searching. Of course, not all so-named groups are involved in anti-GM work (the real Earthwatch, for example, conducts field research tours), but, nonetheless, I strove to avoid a currently-active group name (which is not to say that there isn’t a real EarthAlert somewhere in the world that I simply didn’t find out about. BTW, the concept of “gardeners” is very real and a term commonly used by folks who do this sort of thing. First off I would like to comment that your book is extremely interesting. It was a little slow at first, but it was needed to introduce the exciting events like those is chapter 21. My question is regarding the naming of the company Vanguard. I know a company right now exists with the same name that is into banking. Why did you choose Vanguard? For what are probably obvious legal reasons, I went with a corporate name that could not be construed to be a real company operating in the GM space. On a humorous side note, during drafting of the novel the name of the company was San Monto Corporation, a too-obvious reference to Monsanto, which is, of course, the largest company in the industry (along with Syngenta, Bayer, and others). Yes indeed, there is a financial services company called Vanguard, but they have no agricultural aspirations, so far as I am aware! If they do, I’m sure I’ll be hearing from their lawyers. I was wondering how exactly you go about your word choice. In my own writing I tend to repeat the same words constantly, and I am trying to remedy that. Do you take a thesaurus to your writing, or is your word choice just the byproduct of research, previous knowledge, etc? First, I think a lot of vocabulary comes ultimately from reading. I do, though, try hard to eliminate use of repetitive words, particularly when they occur in close proximity to each other. In those circumstances I will occasionally resort to the thesaurus, but I try to keep that recourse to a minimum. Oddly, the most interesting recent problem I’ve noticed about my writing–particularly non-fiction–is that I have a tendency to overuse the word “though.” It took another editor reading my work to point that out to me! In my experience, the more times you reread your own stuff, the less you are likely to see. It is always valuable having another set of eyes on it. I am really liking your novel. What an interesting topic and storyline. I do have one question though, is there actual scientific evidence that genetic traits can be transferred from plants to animals? This certainly does not greatly affect the story since, after all, it isn’t non-fiction, but i am just curious. Many thanks for the comments. Glad you’re enjoying it. As you observe, the business about transferring genetic characteristics from plant species to animals (and potentially vice versa) is the key technological “leap” that makes the story line possible. And, yes, it is intended to be fictitious. BUT, here’s where it gets interesting! In fact, research has been done (and is, I believe, ongoing) in which the gene is being sought in certain cold-water salmon that allows them to survive in sub-freezing temperatures. The thought is that this gene can be then transferred into certain plant species, thus allowing them to be more frost-resistant as well. So, while the book’s scenario of transgenic plants being ingested and their traits thus being transferred into the animals may be a stretch, it would require quite a lot of hubris to suggest that this is a completely impossible outcome. If you say that parts of Barrett reflect yourself, would you say that you wrote the book siding with big business in the GMO debate? Or was there a different bias? My goal (and I hope it came across this way) was to be as objective as possible concerning GM issues and not interject any personal bias into the narrative. That said, it is probably impossible for a writer to completely divorce their own feelings from anything they write. I would not characterize my own views on GM as strongly for or against, but I am quite cognizant of the issues relating to the technology and I am concerned that GM advocates (like certain biotech companies that stand to profit from the technology) will tend to push out technology faster than is warranted based on available research into safety, etc. At the same time, I believe there is a lot of benefit to be gained, particularly given the large number of people who die of hunger every day in the world. It probably sounds like I’m trying to straddle the fence on this, but it is a complex issue and merits a good deal of thought and analysis. My name is Ian Poblete and I am a student in Mr. Damaso’s Honors English class. I was wondering why you chose to name your book in the way that you did? When I first heard the book title, I thought that it would be more of a non-fiction type. I am also wondering if there is any significance behind the names of the characters or the places that they visited? Regarding the title of the novel, check out my response to Eshaan (second paragraph). The character names are pretty random, (though I will confess to a few small autobiographical elements in the Barrett character). As for the various locations, not a lot of rhyme or reason there either, other than striving to choose places with differing climates (i.e., to suit the crops being tested there) and interesting people. In the introduction to your book, you categorize political issues into two categories: issues based on objective fact and issues influenced by emotion. What is your personal opinion on the role of emotion in politics and decision making? Do you feel like religion should factor into this objective decision making? Lastly, do you feel like the issue of GMO research should be approached from a purely factual standpoint? Thanks for your time. Emotion is extraordinarily important in the public policy arena, almost irrespective of what issue you’re talking about. My point in drawing the distinction you reference in the introduction is simply to provide a bit of a framework for thinking broadly about GM technology. In a couple of respects, I think the GM debate is rather like the climate change debate, in the sense that a) the people in favor of and against it tend to fall neatly into the left and right political camps, and b) there is a terrific amount of available science and literature to inform the discussion, yet many of the most opinionated individuals (on both sides) haven’t bothered to look at much of any of it! They simply adhere to and espouse their view because it’s consistent with the general thread of their political leanings. I have a question about the global problems that the book focuses on. Were you only trying to write a book exposing the issues of world hunger and genetic modifications, or did you also try to reveal the presence of globalization, corporate dominance, and other global issues in the world today? Also, if the answer to the previous question was yes, what was your motivation for including the aforementioned problems in your book? My goal was to at least touch on as many facets of the GM debate as I could, including not only issues of health and biodiversity, but, yes, also the corporate side of things, manifested to a large degree through opinions and actions of the CEO Chase. The only item on your list that I didn’t really touch upon was globalization, as I think that would have taken the story pretty far afield. But issues of corporate attitudes toward testing and safety, profit, liability, and intellectual property are all front and center in this discussion. 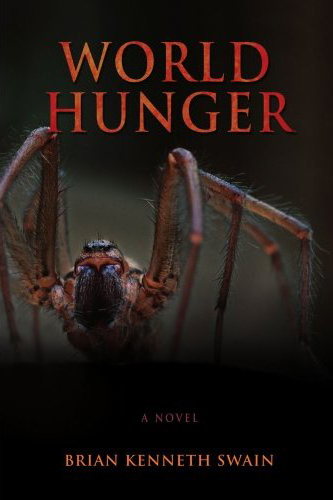 As for corporate dominance, I should mention here that one of the reasons I particularly like the title “World Hunger” is because it has a triple-entendre sort of meaning. It refers to a) the literal hunger of many millions of people around the world, b) the hunger of the mutated insects, and c) the hunger of Vanguard for the achieving dominance (and associated profits) in the GM market. Out of all the corporate issues surrounding GM technology, the one that disturbs me the most is the intellectual property bit, i.e., the ability of a corporation to issue (and profit from) patents on various forms of life, whether created or discovered, and to effectively lock out or control farmers who may have been using the species for generations prior to the company’s arrival on the scene. Since you wrote this book based on the negative impacts of GM food, is that your real personal opinion on GM food? Do you personally think that GM food is beneficial to the world or has a negative impact as displayed in your book? Frankly, my intent with the book was to present a balanced view of GM technology, and to do so in a fictional way that would reach those not inclined to read much nonfiction writing. Choosing a hypothetical negative aspect of the technology as a principal theme was primarily designed to make for a (hopefully) interesting story. As described briefly in the introduction, I do not, in fact, have an inherently negative view of GMO research and commercialization, though I do believe there are aspects of the development that merit great consideration and thoughtful, measured progress. It seems to me that the most potentially serious consequences of GM technology are a) long-term health issues (which, by definition take a long time to manifest and are extremely tough to test for) and b) damage to the ecosystem, especially in the form of inadvertent distribution of pollen/seeds through wind travel into non-GM fields. Matters of corporate profit aside, it seems clear to me that there are real potential benefits associated with GM products, whether in the form of improved ability to grow crops in extremely arid regions, providing health benefits heretofore unavailable (like the vision benefits of golden rice, for example), or simply improving the productivity and lowering the costs of rural agriculture in general. As with all matters of public policy, GM is an extremely complex issue and should not be approached from an over-simplistic, all-positive or all-negative direction (the latter of which happens with some regularity, particularly in Europe). I am one of the students in Mr. Damaso’s Honors English II class reading your book. I have a question concerning the book. How did you go about choosing the countries that were going to be focused on with the various GM products, and why did you choose these specific products to use in this story (rice, bananas, etc.)? The reason for the second part of this question is because I was wondering, were these your favorite foods as a child, or things you hated, or just indifferent? Thank you. The choice of foods/crops to focus on was driven primarily by those agricultural products that are most heavily influenced by GM technology. The first such product in the market was Bt (bacillus thuringiensis) corn, which emits a substance that protects against insect pests. (Something like 85% of all corn grown in the U.S. is transgenic, or GM). That, in turn, reduces the need to use pesticides, which saves cost. Paradoxically, some who are against GM crops feel this way without realizing that they are, as a consequence, opting instead for vegetables grown with increased levels of pesticides. As for the selected geographic locations — not much scientific there aside from choosing locations with different climates and enough diversity to be interesting from a narrative perspective. Thank you for presenting this fictional, though uber-relevant story to your readership. As my students at Brophy Prep investigate the impetus and consequence of Genetically Modified Organisms (GMOs) in WORLD HUNGER, they will likely have QUESTIONS and COMMENTS for you, the author, as the novel relates to their Summit on Human Dignity: Food — From Farm to Table. I, for one, wonder how you approached the RESEARCH aspect of preparing the plot for your novel. Also, did your research influence your previously held understanding and perspective on genetically altered food production? The research phase of writing has always been the most enjoyable for me, and it is certainly a wonderful thing that we have the online tools available nowadays to accomplish it without spending weeks in the library stacks! One of the many bits of wisdom that writing experts throw around is that you should write what you know about. Well, I blatantly violated this tenet with World Hunger, since biology is, by far, one of my least favorite topics, going all the way back to high school (I’m more of a physics/math guy), and one that I know the least about. That said, the GMO debate has been one I’ve been close to for many years and the idea for a novel about it had been floating around in my head for a long time before I finally decided to put “pen to paper.” The fact that I was unable to discover any other available fiction on this topic only reinforced my desire to write the book. I have, over the years, developed what may be an unusual approach to writing fiction, specifically regarding characters. I have a template that contains perhaps 50 questions about what a person is like, and I occasionally sit down and simply create a new person without having any story or book to insert them into. The questions include everything from their appearance to what they like to eat, what hobbies they have, political views, all sorts of things. At the moment I have a “library” of perhaps twenty characters sitting in my files that have not yet made it into any story. As for the impact of my research on my own views on GM technology and public policy–I can’t honestly say that it took me in a different direction. The subject is immensely complex and nuanced, and I certainly enjoyed the opportunity to learn about the different issues attending the debate. Even today, I cannot say that I am “for” or “against” GM food. I believe that, like all scientific endeavor, a great deal of caution is called for in rolling these products into the marketplace, particularly given that the health effects of new food products frequently do not manifest themselves for many years. As for the public policy side of things, I do have a problem with companies patenting seeds/plants that have either occurred naturally or been developed over the centuries by rural farmers. While I understand the need for corporations to protect intellectual property, the idea that a time-honored practice like saving back seeds from a harvest for use in subsequent years could suddenly be made illegal strikes me as patently immoral and counter-productive. As I said, a very complex and fraught issue that merits continuing debate (not to be confused with the demagoguery and vitriol that frequently arises). Many thanks again for reading, and for involving your class in this important discussion.